Will the Vikings' story ever change during this lifetime? The way this Vikings season played out made it seem like they were fated to play in and win the Super Bowl. It turns out many of us mistook a great story line for fate. 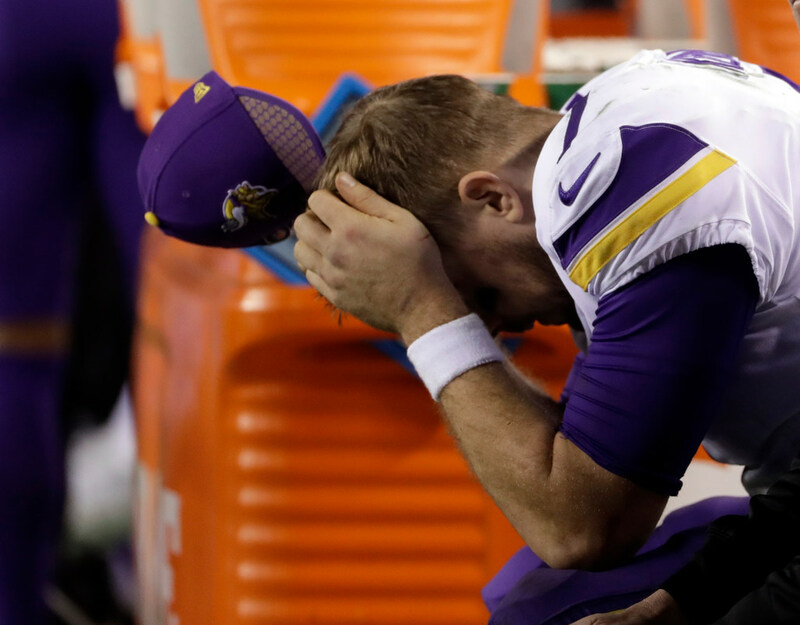 Video (01:25) : In a somber locker room, Vikings players agonized over what they said was an uncharacteristically poor performance in their 38-7 NFC Championship Game defeat in Philadelphia. The Vikings last went to the Super Bowl following the 1976 season. I was born during that season — a day before their first loss, actually — and was a little over two months old when they lost 32-14 to the Raiders in the Super Bowl (thankfully, there is no memory of it). They have not been back to the Super Bowl since then. A conference title game loss the next year in 1977 (I don’t remember that one, either) signaled the end of a dynastic era the ended without a Super Bowl title. Five more conference championship losses have followed: 1987, 1998, 2000, 2009 and Sunday. All of them have hurt Vikings fans in various ways and to various degrees. I was 22 and just finishing up college when the Falcons shocked the 15-1 Vikings. I was 33, married but without kids yet, when the Saints won a game for the ages. Most people would agree those two were the worst, even if they have a hard time ranking them. They still hurt in retrospect. As a now 41-year-old father of two, Sunday’s game didn’t mean the same to me personally that some of those other games did. Being a parent tends to change your perspective on games, and maybe it helped that Sunday’s outcome — Eagles 38, Vikings 7 — was a blowout along the lines of 41-donut. Selfishly, though, the idea of the Vikings playing in a Super Bowl at U.S. Bank Stadium — one that I am going to help cover no matter who was playing — had huge appeal. The Vikings were one win away from launching a two-week party the likes of which we have never seen around here. Instead? I have to imagine there will be a wide swath of football-loving Minnesotans who will actively avoid the Super Bowl. I feel for those people, and I don’t blame them. The way this Vikings season played out made it seem like they were fated to play in and win the Super Bowl. They persevered through massive amounts of adversity. The biggest quarterback obstacles in their way — Aaron Rodgers of the Packers and Carson Wentz of the Eagles — were swept up in a wave of NFL injuries, seemingly clearing a path. Ah, it turns out many of us mistook a great story line for fate. I looked it up and saw the Steelers lost the week after the Immaculate Reception (then promptly ignored it). Numbers suggested the Vikings’ offensive line could be in for a long day, but many of us brushed that off, too. At least we know one thing: You can’t accuse the NFL of being rigged. A Vikings/Patriots Super Bowl would have been far more compelling — not to mention engaging for the local community — than the one we got. The game was legit, and the outcome was earned. After the sting of Sunday wears off and the Super Bowl has come and gone, maybe we can appreciate this 2017 Vikings season for what it was: a good team that overachieved and gave us one amazing playoff finish before ending with one huge disappointment. Maybe sometime in this lifetime the story will end differently.